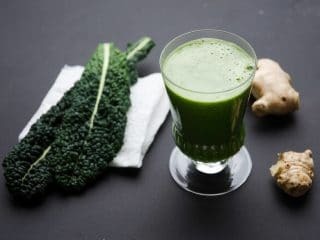 Balanced Green Juice was the first-ever green juice recipe posted on Umami Girl, way back in 2013, after having kept it to ourselves for at least six months of daily drinking. It stands the test of time, though these days we tend to default to our Basic Green Juice. Get to know your own juicer and adapt your method accordingly. Like ovens, juicers vary a lot in their particulars. Green juice should taste as good as it makes you feel. This recipe strikes a pleasing chord with well-balanced sweet, tart, spicy, and hearty flavors. Feed all ingredients through juicer in the order listed. Strain juice through a fine-mesh sieve if you like. Stir well, divide between two glasses and serve immediately. With the exception of the lime, you don't need to peel any of the ingredients. Cut produce as required for your individual juicer. Do buy organic produce for juicing when possible, since juice is a concentrated source of everything its ingredients contain, including nutrients and pesticides. Juice the ingredients in the order listed to maximize yield. Finishing with a very juicy ingredient like celery helps to flush more stubborn ingredients like ginger through the juicer. A note for centrifugal juicers: When juicing greens such as the kale and cilantro in this recipe, you'll get a better yield if you tightly pack the greens (roll them up before adding to the feed tube of your juicer) and place them between two harder, juicier ingredients (such as the cucumber and apple here). Nudge the greens through the juicer one small push at a time. If your juicer has multiple speeds, use a slower speed for softer ingredients like the lime, kale, and cilantro. 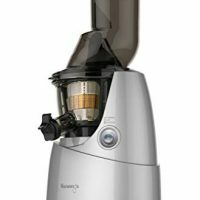 Keep in mind that juicers vary a lot in terms of design and yield, so your mileage may vary.